Many things have an impact on your health. Your diet and activity levels are the obvious ones. But also how much sleep you get, how much stress you experience, and how much time you spend outside in nature. If you've read this blog for any length of time, you know that stress has a huge impact on your health, but it also plays a huge role in the development of disease. It does everything from increases your chances of getting a cold to being the major cause of almost every autoimmune disease. It's a big deal and it definitely doesn't get enough attention. Managing stress is one of the first things I talk about with my patients when they come to me frustrated because they can't meet their health goals despite a healthy diet and exercise. They are often surprised when I tell them that stress can undo the health benefits of any other healthy lifestyle changes they may have made. If you don't manage stress, eating healthy and exercising won't make a difference. I also recognize that prioritizing these lifestyle factors is much harder to do than changing the way you eat. Chronic stress can cause metabolic syndrome (a syndrome made up of obesity, blood sugar dysregulation, and high blood pressure), sleep issues, systemic inflammation (which we know contributes to almost all diseases), issues with blood clotting, problems with immunity, and contributes further to poor health behaviors such as increased appetite, cravings, and overeating. No matter what your health goals are, it is absolutely essential that you manage your stress. You probably know what causes you to feel stress, but the most important part of understanding stress is understanding the difference between chronic and acute stress, because they impact your health very differently. Acute stress can actually enhance your health (or save your life) in certain situations, while chronic stress causes more harm than good. Our hunter-gatherer ancestors only experienced acute stress. Situations like being chased by a bear or falling off a cliff were the only kinds of stress they knew. When you experience a situation like that, your fight-or-flight response is activated in order to make sure you live to tell other people about your close encounter with death. During this acute stress response, the hormones cortisol and adrenaline are released. Once the dangerous event is over, you are either dead (because you got eaten by the bear) or you lived (because you fought back or were able to get to safety). Either way, your body would have stopped the production of adrenaline and extra cortisol and you would have gone on your merry way. Chronic stress is the kind of stress that sticks around for a long time. It can be at such a low level that you might not even really notice it. This is the kind of stress you feel from having a job, raising kids, and needing budgeting your time and money effectively. It can be more serious such as from a deadline at work or school, an important exam, an illness, a divorce, or death in the family. The difference between chronic and acute stress is that the chronic stress doesn't end, it just keeps going and the effects build up over time. Stress impacts the immune system, mostly in the form of inflammation, and inflammation contributes to almost every disease or health condition known to mankind. Your immune system regulates the inflammation in your body. While inflammation is not the only contributing factor to chronic disease, we know that chronic diseases do not develop unless there is inflammation. If you suffer from chronic stress, you increase your risk of getting sick, even a minor viral illness. Have you ever gotten stressed at work and suddenly come down with a cold? That's likely because of the impact of stress on your immune system. In order to understand the relationship between being stuck in a traffic jam and how well your immune system functions, you need to understand what is happening inside your body when you are rushing to get to work on time day after day after day. The hypothalamus: The part of the brain responsible for things such as regulating body temperature, hunger, thirst, fatigue, sleep, and circadian rhythms. The pituitary gland: A gland that secretes hormones such as thyroid stimulating hormone (TSH), growth hormone, and adrenocorticotropic hormone. The adrenal glands: Two small glands that sit on top of each kidney and secrete cortisol, epinephrine (also called adrenaline), norepinephrine, and androgens. The hypothalamus releases a hormone which signals the pituitary gland to release adrenocorticotropic hormone (ACTH), which in turn, signals the adrenal glands to secrete cortisol and adrenaline. Cortisol has many effects on the body. It plays a role in metabolism, insulin sensitivity, immune functions, and blood flow to certain areas. If you are in danger and running away from a bear, the effects of cortisol make sure that only the functions that are needed for your survival are happening inside your body. These functions include making decisions (so making sure your brain has plenty of fuel), glucose for your muscles, and even processes that prepare your body for wound healing. Functions that are not essential for survival such as some immune functions, kidney function, and reproductive functions are suppressed. If the stress doesn't go away, the HPA axis remains activated and this is why chronic stress is such a huge issue. All of those non-essential functions that are suppressed when cortisol is elevated never get a chance to be prioritized and your body suffers the negative effects of this. Cortisol is needed for wound healing and for the immune system to fight infection. Research shows that short-term, acute stress can actually enhance immune function in some organs, such as the skin. These functions are helpful when it comes to acute stress (short-term) but they cause trouble during chronic or prolonged stress. While the details of what chronic stress and elevated cortisol actually do to the immune are not very clear, what is clear is that chronic stress does cause some level of dysfunction. Cortisol causes changes in the chemical messengers responsible for inflammation (called cytokines). Which then changes the way the immune system communicates with itself and turns on the parts that attacks foreign invaders or causes general inflammation (which is necessary for a healthy immune response). The exact response that the immune system has to chronic stress varies because of hormones, neurotransmitters, and whether or not you are already fighting an illness. 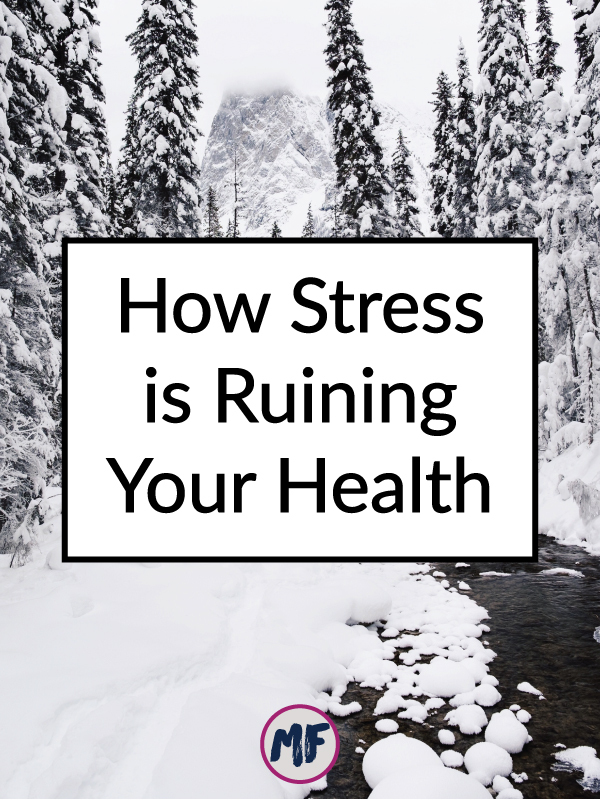 The point of all this is that chronic stress increases your chances of developing almost any type of disease - autoimmune disease, cardiovascular disease, metabolic syndrome, osteoporosis, depression, infections, and even cancer. Your gut forms a barrier between the inside of your body and the outside world. While it may seem strange, the stuff that's inside your digestive system is actually on the outside of your body! Your gut has the very important job of letting nutrients in while keeping everything else out. The barrier of your gut is made up of highly specialized cells called enterocytes. A leaky gut, also known as "increased intestinal permeability," means that things are crossing the barrier of your gut that shouldn't be. This happens when the enterocytes or the stuff that holds them together are damaged. Don't worry, the thing that are crossing into your bloodstream are giant pieces of food, but tiny bits of incompletely digested proteins, some bacteria, and other waste products or toxins. All of these things turn on your immune system once they get inside your body. Some of these things can cause inflammation all over your body (generalized inflammation) and some stimulate a more specific immune responses (such as certain proteins, like gluten, causing a food intolerance or allergy). Cortisol opens up the spaces (the tight junctions) between the enterocytes in your gut making them "leaky," and there is a growing list of health conditions that are linked to leaky gut which is why managing chronic stress is so important. In almost any autoimmune condition where leaky gut was looked for, it was found. There is even some speculation that you may need to develop leaky gut in order to go on to develop an autoimmune disease. How do you get rid of chronic stress? Managing chronic stress involves two important parts: decreasing stressors and increasing resilience. Resilience is your ability to adapt in the presence of stress. That doesn't mean that you aren't affected by or don't feel stress, but that you are able to handle stress without completely unraveling. Things you can do to increase your resilience include meditation, yoga, laughing, walking, social bonding, and getting plenty of quality sleep (no less than 7 hours each night). You can also have a stress response based on a just your thoughts or the perception of a threat, even if it's not actually a threat. This is important to recognize because you can actually reframe the way you think or feel about certain situations in order to no longer perceive them as threatening. This is where mind-body practices such as yoga, meditation, or other mindfulness techniques can be helpful. Addressing any underlying causes that affect your mind can also help change your stress response. Issues such as heavy metal toxicity, vitamin deficiencies, and food allergies all contribute to the way you perceive stress. Your diet also affects the way your body responds to chronic stress. There are studies that show that deficiencies in omega-3 fatty acids can exaggerate your stress response, but that supplementation with DHA and EPA can reverse this and decrease your stress response. Eating a diet focused on whole foods (such as a Paleo diet) can help balance your blood sugar which can help maintain hormonal balance (which in turn affects your overall stress response). Melamed, S., et al., Burnout and risk of cardiovascular disease: Evidence, possible causal paths, and promising research directions Psychological Bulletin, Vol 132(3), May 2006, 327-353.